(Mens XL) Ugly Xmas Sweatshirt! Super Cuteness Kitten Swinging from a Bell! Home > Ugly Christmas Sweaters > Ugly Christmas Sweatshirts > (Mens XL) Ugly Xmas Sweatshirt! Super Cuteness Kitten Swinging from a Bell! 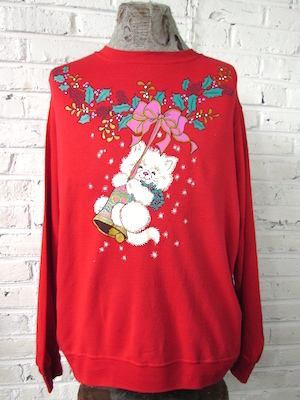 Vintage ugly Christmas sweatshirt! Crazy super cute fuzzy white kitten swinging from a bell attached to a garland of holly draped around the collar of the sweatshirt! Sweatshirt has a bright red base. Tagged by Blair. No material tag probably Acrylic or a Poly / Cotton blend. Condition: Very Good. Has a few cracks in the paint and a little bit of pilling. Does not detract from the awesomeness of this sweatshirt!